The Toronto Raptors selected forward Andrea Bargnani with the top overall pick in the 2005 NBA Draft. Bargnani came to the NBA after spending time as a professional in Italy. The seven-footer appeared in 65 games in his rookie season, averaging 11 points and just under four rebounds per game. Bargnani spent the first seven years of his career in Toronto before being dealt to the New York Knicks in 2013. With the second overall pick in the 2005 NBA Draft, the Atlanta Hawks selected North Carolina guard Marvin Williams. A pair of future All-Stars would be taken off the board next. First, the Utah Jazz chose Illinois guard Deron Williams with the third overall pick. The New Orleans Hornets then took Wake Forest guard Chris Paul fourth. The Charlotte Bobcats selected North Carolina guard Raymond Felton. Another pair of future All-Stars were taken outside the top 10 in the first round of the 2005 NBA Draft. The Indiana Pacers grabbed Danny Granger 17th overall, while the New York Knicks selected David Lee with the final pick of the 2005 NBA Draft. Other notable players taken in the first round include Gerald Green, Nate Robinson, Jarrett Jack and Francisco Garcia. Chris Paul was selected as the Rookie of the Year for the 2005-06 NBA season. Paul, along with Bogut, Villanueva, Deron Williams and Frye were named to the All-Rookie First Team. 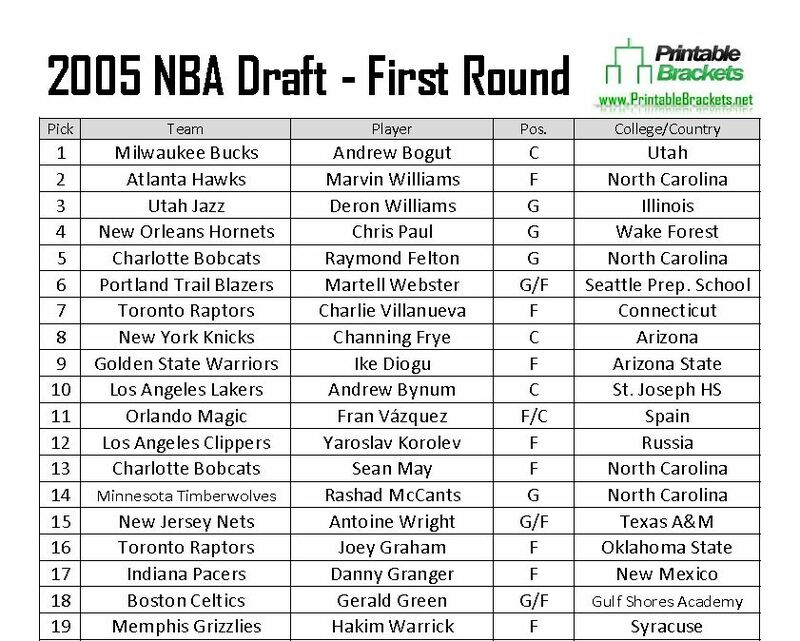 Notable players who went unselected in the 2005 NBA Draft include Will Bynum, Chuck Hayes, Aaron Miles and Ronnie Price.